Only in Wisconsin can we enjoy the Ice Sailing World Championships. In fact, Wisconsin has ice boat yacht clubs. Yes. We’ve found the ideal bland of winter and yachting. Of course, the sub-light speed viscosity of the runner on the ice, mixed with wind, makes for a high velocity sport for certain. Sailors who enjoy liquid water compete in this sport, and it’s important to note that skippers suit up with helmets, lashed in on their backs, running a mainsail, which in the case of the most common DN class boats are 60 square feet, exceeding speeds above 50 MPH at times. That’s a hefty speed for sailors. And also, flipping the boat means a hard landing on ice. But it’s a little odd that these racers are called boats. It makes more sense to call them ice sleds. It’s a hull attached to a perpendicular cross piece called a runner plank. It runs on three skates, or runners, attached to the “boat”, with one on each end of the plank and at the fore end of the hull. So to call these things boats like calling a canoe a sled because it’s on the ice. Okay that sounded better before we wrote it, but let’s just keep it anyway. 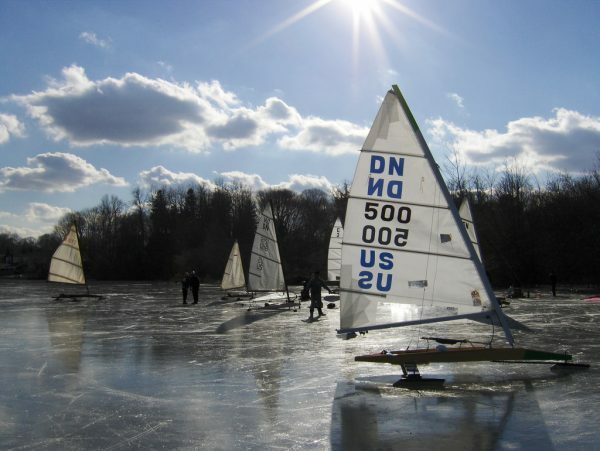 “Ice boats are strictly wind powered and need relatively snow-free ice to sail.” That’s according to iceboat.org and the Green Lake Yacht Club in Wisconsin. So the funny thing about that is that the world championship on Jan. 22 was called off due to too little wind and too much snow, and so the series was just called in favor of America’s Cup Veteran karol Jablonski. Regardless of the definitions or reasons, these ice “boats’ make for a wonderful and speedy good time.